Belle On Trend: Pattern Play: Dare to be BOLD! Polka dots and stripes in the same outfit? Plaids of different colors, worn together? For shame? Or... for sure! Pattern play is a newer concept for me. I started embracing it purely out of practicality: northern Illinois gets COLD from November to March. A sweater alone was simply not enough. I always need a sweater and a collared shirt underneath for work. Thus, my own "uniform" was created. At first, I played it safe. A green and navy sweater? Ok, I will pair it with a plain chambre shirt underneath the sweater. Safe, yes. Fashion forward? Not nearly enough. (Below, playing it safe in polka dots and chambre and bows and chambre). The bow sweater is old, but here is something similar: from Saks off 5th. The necklace in both pictures is from Charming Charlie's. Here is an even better one from Bauble Bar. My earmuffs are Kate Spade, compliments of my darling hubs. Here is a pair with a fabulous bow! That's my sweet Goddaughter with me below. Above, I added a different patterned shirt, similar: here. And a striped infinity scarf: this is a fun alternative, though not infinity. I began with this navy gingham shirt from the J.Crew outlet. I decided that adding polka dots on top would spruce it up a bit for the foreboding winter months. I liked what I saw! This was the original sweater. Unfortunately, it is no longer available. But here's a nice alternative: from J. Crew factory. Also, here's a black and white version from Mindy Mae's Market (the cutest website!) that you could pop a color (or collar!) under! Additionally, I discovered plaids and jewels, thanks to an amazing fashionista, Sarah Vickers. Check out her fashion blog! Gap collared shirt, old, but a similar one found here is 40% off! Necklace, old, J. Crew Factory. Check out this one, instead. Have I seen pattern play over done? Absolutely. But, I can give you some tips and tricks on keeping it manageable. 1. Stay within the same color scheme. It might be too much to pair green with red (unless it's Christmas), but if there is a pop of red in your navy sweater, feel free to compliment it with a blue gingham. Further, look at the colors intertwined in your plaid shirts-- perhaps choose to pick up the fainter pinks or yellows in your "base" layer. Same blue gingham as above. My sister got me that awesome J. Crew apple sweater (which has since sold out), but here is a super cute alternative (25% off!). 2. Add your statement jewelry into the mix. Pick up the tones of either layer to highlight your jewelry. 3. Usually 2 different patterns are going to be the best bet for pattern play. Anything more gets a little chaotic. If you are rocking stripes and polka dots on top, opt for a solid pant on the bottom. (Try these Winnie Pants in any solid color. They're so flattering and tailored for work! My girl Court and I love them!). Also, patterned tights rock! But not if you are already mixing two patterns on top. 4. Collared shirts under sweaters aren't the only way to mix patterns. Try adding a different pattern under a jumper to take your sheath dresses through the colder months. Also, throw a striped blazer on top of a dress to work the pattern play with a dress. 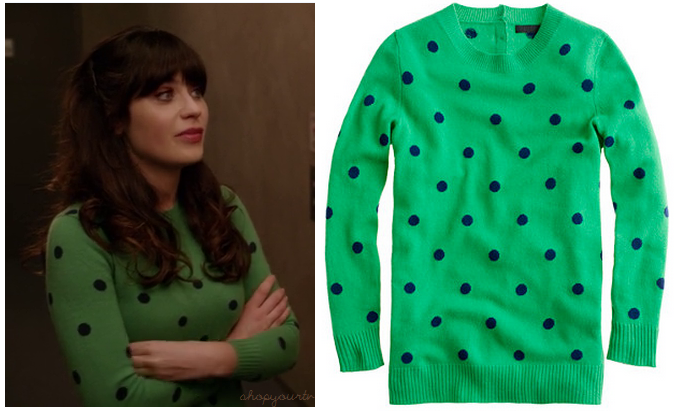 Above: I have this jumper in three colors. I get so much wear out of it! The yellow is no longer available, but the gray and red are fabulous colors. You can wear any patterned shirt underneath in the winter, or you can wear it sans plaid in the warmer months! This the the yellow jumper in teal. I LOVE the fit, too! Very flattering, fit and flare type style. Above: Ann Taylor blazer and dress. Got this idea from A Lacey Perspective. Check out her blog, too! Above blazer, Gap-- uber clearance last summer. Here's a nice alternative: from Nordy's. The dress is Lilly Pulitzer. I would replace it with this stunner, and choose the white and gray striped blazer. 5. Critter shirts work great with tailored, colored skirts. Critter shirts can also work so well with a pop of color short, as pictured below. In other words, if you have a navy critter (anchors, etc.) on your top, opt for a complimentary color bottom, instead of a safe navy bottom. (And if you want to rock critter shorts or pants as a man, please contact Jeremy Pittenger because he knows how to wear a critter!). My shorts were old J. Crew factory, but here are some from Target for under $20! My tee shirt was also an old J. Crew Factory purchase, but I love this striped J. Crew tee that is currently 40% off! And this Gap Oxford, too! The red polka dots are adorable! My monogram necklace is from Moon and Lola. 6. Outerwear like vests or scarves can enhance your pattern mixing. I layered a chambre, polka dot dress with a buffalo plaid vest. That day, I remember specifically, was a high of 16 degrees. I added a gray sweater to pick up the gray of the vest. I wore navy tights and my brown Frye boots. My cousins at Bryn and Jack's birthday party! 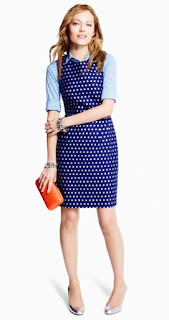 The polka dot dress from Loft was an old purchase, but here is an alternative polka dot shirt dress from Ann Taylor! Currently 50% off. 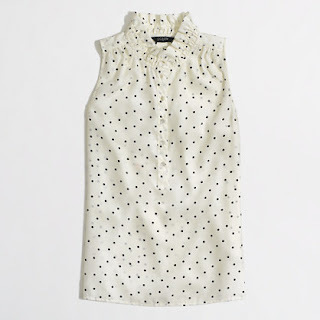 Under my vest this time I wore a black and white polka dot sleeveless shirt (below, old. But, even better here from Brooks Brothers) and a yellow Banana Republic sweater (similar here, and it is 25% off!). I topped it off with the multistrand pearl necklace from J. Crew Factory. You cannot go wrong with that statement pearl necklace. I wear it SO much. Currently a steal at $31.50! Have fun with your pattern play! Embrace the PLAY of it! You made my whole night! Thank you soooo much!!! :):) Means so much to me, girl!